A question that often crops up is: what do I need to start cooking? First of all, a good website! Just as well, you're already on it ;-), and after that a minimum of equipment and a few items you should always have in your cupboard or fridge. Here are a few basic guidelines to help you when choosing. On the cooking utensils page, I stress the importance of the equipment; it's very hard to start cooking well if you don't have the minimum of vital utensils. I have already made a list of the basic essentials The 10 essential tools (those without which I really can't do anything), but let's try and reduce the list still further to create a beginner's kitchen survival kit, which might be what you find in these few lines below. 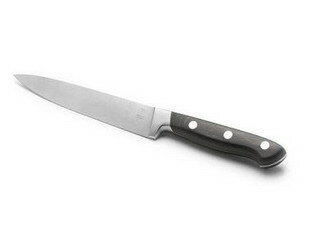 1) Knife: Medium size, stainless steel, plastic handle, with a sharpener (one with 2 metal discs that the knife blade slides between, or, if you feel confident, a butcher's steel, but you'll need to learn the correct technique, which is not easy). 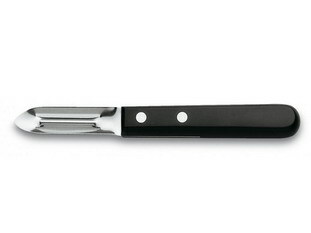 A good knife really is THE first thing you should buy, without which good cooking is impossible. Don't hesitate to buy something that seems expensive, perhaps one of the top quality brands, as it's an investment for the future. 2) Chopping board : Get one made of synthetic material, large and thick enough for you to use comfortably. This will enable you to chop, slice, cut,… without spoiling your table or worktop, and without blunting your famous knife. Even if it's tempting to get a wooden board that seems natural and practical, it's best avoided as the wood absorbs and keeps the smells of whatever you have been cutting up, it's more difficult to keep properly clean, and you'll inevitably end up putting sawdust in what you are making. Equally, avoid boards made of metal or glass, they're just useless trendy gadgets. 3) Weighing scales : There's so much that needs weighing and measuring when you cook, particularly when baking, so scales are vital. 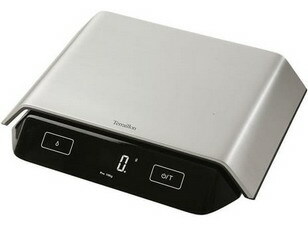 I strongly recommend electronic scales as the most practical as they have an automatic add and weigh fuction and are now very affordable. 4) Spatula : A sort of flat wooden spoon, this is a multi-purpose tool for stirring in pans, pushing items off the chopping board, lifting, turning, etc. It's important that this should be wooden as it doesn't transmit heat like metal, so you can use it or leave it in a very hot pan without risk of burning yourself, which is not possible with a tablespoon, for example. 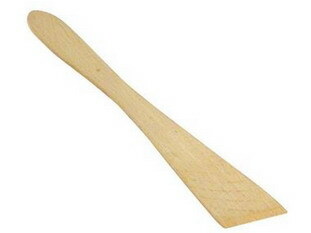 5) Vegetable peeler : This is simply a special blade on a handle for peeling certain vegetables easily. 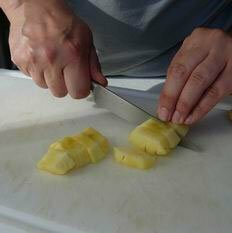 You can peel potatoes with an ordinary knife, but you need a chef's skill not to end up with peelings as thick as your thumb! So this is a good choice for a beginner. There you have it: the short list of 5 items that's enough to get you started. If you want to go further, see the cooking utensils page. To make any recipe you will of course need to put together all the necessary ingredients, but if you look at the ingredients page (sort the table by the number of times items are used), you'll see that some reccur often, even very often. So it's a good idea to come up with a list of items which you should always try to keep either in the cupboard or in the fridge, and which will provide your "cooking base". Here is some advice for making up your own, with 10 ingredients that are simple, but almost indispensible..
1) Salt and pepper: Almost impossible to cook without them, some will tell you that it's by these that you can recognise great chefs: just with salt and pepper they are able to bring out all the flavours of a dish. Always have a tub of fine salt and ground pepper. If possible, also have coarse salt and a pepper mill which you can fill yourself with peppercorns; it gives a better and fuller flavour. 2) Oil and vinegar: A bottle of each, kept out of the fridge and chosen according to your taste. For example, my choice would be olive oil and red wine vinegar. 3) Mustard: A simple mustard, Dijon style, in a pot kept in the fridge. 4) Sugar: Caster sugar, preferably kept in an airtight jar. 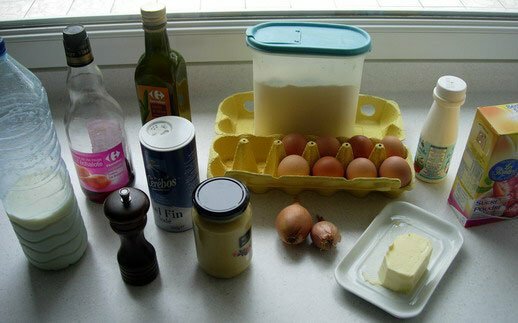 5) Butter: Real butter, not fat-reduced, organic if possible, kept in the fridge. 6) Eggs: Organic eggs if possible. Contrary to received wisdom, there's no need to keep them in the fridge. 7) Flour: Basic white flour, kept in an airtight container. 8) Onions and/or shallots: These can be kept in the vegetable compartment in the fridge, or at room temperature. 9)Milk: Organic milk if possible, whole or skimmed according to taste, kept in the fridge. 10) Cream: Organic cream if possible, single or double according to preference, kept in the fridge. Of course, this can be modified to fit in with your habits and preferences, but at least with this list you have a good base to build on. You will notice that I often stress the quality of the ingredients, as this is important not just for the dishes you'll be preparing, but also for you. As a general rule, whenever possible , try to find the best ingredients you can, fresh, sound, and unfortunately often more expensive than the others, but that's the price of good health. Once you have some good basic equipment and ingredients, you need to get started and choose a recipe. No problem there - plenty to choose from on this site! If you're not sure, look at the list of all the recipes. They're all written and photographed, or filmed, to help beginners. I suggest you also look at the "Recipes - a few tips" page. Here you'll find all you need to know before tackling a recipe, whether from this site or elsewhere. 1) Cooking at home is fun, it should be enjoyable for everyone involved: you, your family and friends. 2) Cooking is a pleasure to do, but above all to share; nothing beats seeing how your friends or family appreciate what you have done (especially when you've worked hard). The French chef Joël Robuchon says in one of his books, "To double the pleasure of cooking, it needs to be shared". 3) Don't be too ambitious at first. Start with a fairly simple recipe, to learn the basics, then progress. Put simply, this means: avoid recipes with the symbol. It might be tempting to try macaroons, but that would be to make things difficult for yourself. 4) Allow yourself the best conditions: don't invite guests the first time you try a recipe, as you will put yourself under unnecessary pressure. 5) Relax! Cooking is flexible. When the recipe says "leave to stand for 15 minutes", if you leave it a few minutes less or a bit longer, nothing's going to explode. Similarly, if you don't have a particular ingredient, don't panic. You can often substitute something else. But be reasonable, all the same: if you don't have any flour, there's no point trying to make a four quarters cake! At which point you must be thinking, "Is he joking? Flour's one of the basics, so I always have some in the cupboard." 6) Enlist helpers! You've invited friends, so put them to work. Cooking together is fun, you just need to allocate tasks at the beginning, you stay in charge (the "chef", which just means boss! ), and you can all laugh and chat while cooking - always a great time. On the subject of roles, there's one which should not be overlooked: that of glass filler (who might also be responsible for opening bottles). It's a noble task, which has a huge influence on the mood and morale of the workers. The best in the world at this is my friend Robert. 7) Stay calm: everything's gone wrong, it's burnt, too salty, inedible, you've completely ruined it, and yet you're sure you followed the recipe to the letter, damn it! Oh yes - it happens, even to chefs! You might cry tears of rage, but that won't get you anywhere. For times like this you need a survival strategy: get out of the kitchen right away, and order pizzas for everyone, or go out and eat - even something simple - if you can. It's the best way to get over your disappointment. Later, with a cool head, you'll have time to analyse what went wrong, have another go, and this time (or the next...) get it right. - clean the worktop with soap, especially if you've been peeling muddy vegetables on it. 9) Let the children get involved: if you have children or grandchildren, make them feel welcome in the kitchen (except of course when you are handling something dangerous like hot oil, boiling caramel, or anything very tricky). Encourage them to get their fingers into and handle everything (not sharp things, of course! ), let them stir with a spoon, mix with their hands, dip a finger in the chocolate, make crumble, and above all taste, even if it's not cooked yet! It's now or never that they'll be ready to try new things, new tastes, new combinations. In short, help to open their eyes and their minds. 10) Cooking is not some sacred act, nor an exact science: so you can try anything that comes into your head. You might have a flop, and it often happens, but never mind, you'll do better next time! I found this very helpful thank you.